Come see my new creations and be part of a plant printing experiential at the Chetstone Spring Makers Market. Free admission. Shop Small, Give Well allows women in Connecticut to shop their favorite New England artisans in a single location and on a single day. Presented by The Perpetual You and mActivity, the market will feature makers selling jewelry, art, paper goods, pottery, candles, and skincare. 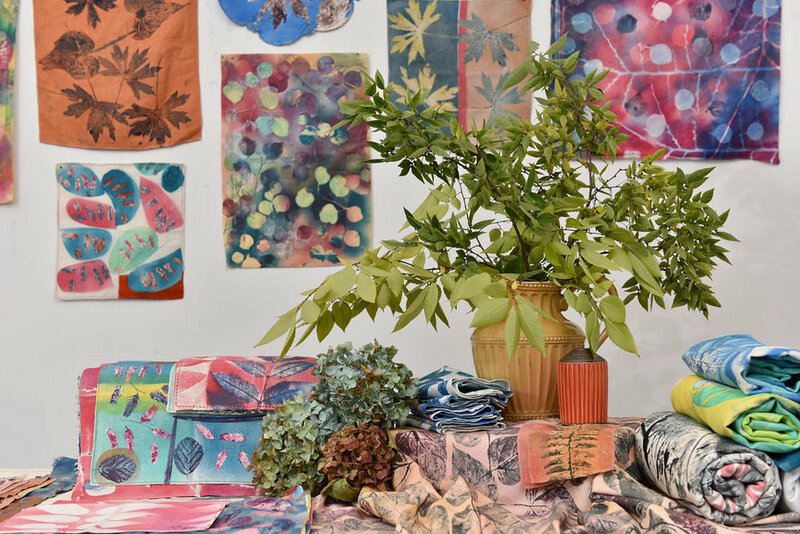 Join Briah and a group of inspired women to delve into the creative process of plant printing on fabric and paper! Work with nature and feel a balance of support and freedom as you surprise yourself and increase your well-being. *SOLD OUT! Please visit the Workshops & Events page to sign up for a future Plant Prints on Fabric event. Come see my new spring creations and enjoy this festive night in New Haven! Join Briah and an inspired group of women to create one-of-a-kind hand printed monotypes using a variety of plant life. Briah will guide you in evolving your very own art fabric using printmaking and silk painting techniques. Join Briah and an inspired group of women to enjoy the connection of community and creativity for open studio evenings. Feel supported in printmaking, drawing, collage, and mixed media. Sessions offered from 5pm - 8pm on Tuesdays, July 16, 23, 30 and August 6. Do you find yourself lost in the past or future? Or running through your to-do list while moments pass by? Do you feel unfocused and under inspired? Do you feel stagnant creatively? Every season brings new energy into the world and with it, transformation. Women thrive through transformation by revitalizing their lives with ritual. Join us for art feasting and inspired making of compassion flags and ritual cloths and bring new life into your days. Every season brings new energy into the world and with it, transformation. Women thrive through transformation by revitalizing their lives with ritual. Join us for art feasting and inspired making of sacred vessels and inspired candle light and bring new life to your days. Every season brings new energy into the world and with it, transformation. Women thrive through transformation by revitalizing their lives with ritual. Join us in designing your own energy cards to inspire your Spring days. Join Briah and a group of inspired women to create mini-adventure books. A reflection on the joy of past adventures or a look ahead to future trips is the perfect way to light up your mini-book. In this workshop, you will use accessible book making techniques and multi-media collage work to create an artistic container for those times that make your heart soar. Do you find yourself lost in the past or worried about the future? I have been there, and so have most modern day mom’s of school aged children. Would you love to find yourself more in the present moment? Knowing that you have nourished yourself, and are therefore ready to be truly available to the whole of your life, especially your children? Would you like to feel more in tune with your intuition, and find your self-expression more accessible?Would you like to open up to possibility through creative curiosity? If so, Mom’s Open Studio Series (M.O.S.S.) is a great place for you! M.O.S.S. is a creative community for mothers of children from birth to college. M.O.S.S. is an opportunity to thrive through guided and free form art making. M.O.S.S. is where you can safely choose to step into your artist self while exploring the intersections of womanhood and mothering. M.O.S.S. allows you time and space to use the creative process of hands on art making for insight. Practice being present through creativity, and bring the power and beauty of your presence home to your children and families. Tap into your intuition and aesthetic to reinvigorate your sense of self in ways that have the potential to serve the whole family. Be part of this wellness promoting community and thrive. Sign up for our Preview Workshop for a hands on creative session, and to learn more about MOSS and how to become a member. Have you made a New Year’s intention? If not, then join Anna Ramirez (creative and educator) and Briah Luckey (artist and art therapist) as you join in community and wellness through art. You will learn about the power that comes from ancient and modern spiritual rituals and how they have guided and sustained the human spirit. A spiritual altar (sometimes called a personal altar) is a place of focus for spiritual awakening and inner transformation. It is where you can set intentions, express gratitude, meditate, reflect, and call on your spirit guides for help. Come join us (Anna and Briah) to move towards your intentions, whatever they may be, through guided journaling, painting, collage, mantra creation, and hand shaping of heart stones, all as part of your own personal mini altar building. Artists & Fleas is a marketplace of makers - tastemakers, experience creators, designers, collectors and curators. Together, this creative community of shoppers and sellers comes to discover and be discovered. Artists & Fleas has cultivated an international reputation amongst buyers, trend-spotters and creative entrepreneurs as a place to showcase and discover what’s new and exciting in fashion, vintage, art, design and more. Briah Luckey is excited to be joining a group of 75+ individual sellers the first and second weekends of December. Creations by Briah Luckey are one-of-a-kind hand printed monotypes using a variety of plant life on vintage cotton and linen. The shapes and impressions that make up the fabric patterns are created using individually inked leaves and plant stems, paired with plant silhouettes created with spray-dye techniques. The positive and void is central to the dynamism as color and texture bring the viewer into the forest with each look. Every piece can be used functionally, as art, or re-purposed into garments or bedding, each possibility decorative and natural. Create side-by-side with Briah! Make your own one-of-a-kind larger art piece with intimate guidance, 2 spaces available. Join a group of inspired women to ink and print plants, including seaweed, on your choice of paper and fabric. Join a group of inspired women to sample plant printing techniques with Briah. Use printmaking ink, beeswax crayons, watercolors, and stamping techniques to bring to life a series of your very own art. Join a group of inspired women to sample plant printing techniques with Briah. Use printmaking ink, beeswax crayons, watercolors, and stamping techniques to bring to life a series of your one-of-a-kind plant prints. Bring to life your very own series of plant prints at our Mother’s Day workshop. Connect with your creativity through the shapes and textures of nature by making unique leaf rubbings and seaweed prints. Paint and draw on the prints using a variety of techniques to bring them more fully to life as one of a kind art papers. This workshop is an open studio style creative session. Come on your own, as a mother-daughter combo, or in honor of your self as a mother or daughter.